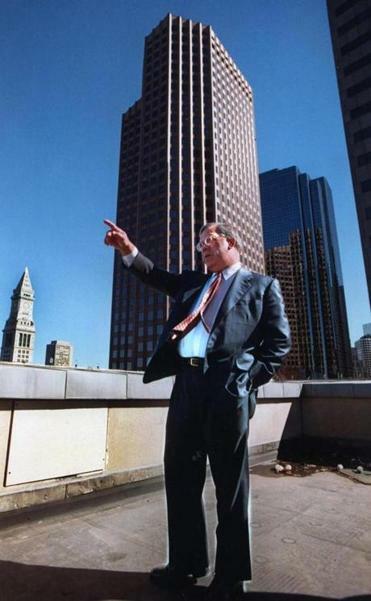 Boston Mayor Thomas M. Menino standing on a downtown rooftop in an undated photo. The cranes rising above Boston’s Seaport district mark the spot where Boston Mayor Tom Menino’s legacy looks to be rising. The Seaport that Menino inherited 20 years ago consisted of hundreds of acres of rotting piers, windswept parking lots, and shabby brick warehouses. He will leave City Hall with gleaming new restaurants, apartments, and office towers rising along the waterfront, and the old warehouses buzzing with young tech firms. This part of Menino’s development legacy stands out, because it’s both obvious and hugely tangible. But focusing on what Menino built crowds out his real accomplishment, which was changing the relationship between Boston neighborhoods and downtown development. Roiling tension over development defined Menino’s predecessors. Kevin White built the Financial District and saved Faneuil Hall, but left office caricatured as a downtown mayor. Ray Flynn framed his successful 1983 mayoral run against White’s downtown focus, arguing that he would return City Hall’s focus to the city’s neighborhoods. Flynn’s opponent, Mel King, tacked in the same direction. Menino became the first modern Boston mayor to straddle both these worlds. For all his efforts to cast himself as an urban mechanic focused on the nuts-and-bolts minutiae of city government, Menino relished the role as city-builder as much as White did. He relished the small details of development, as when he famously picked out the crown-like structure now sitting atop the office tower at 111 Huntington Ave. And he enabled the new development in the Seaport, a legacy-building project as big as anything White did downtown. Mayoral boosters shouldn’t just celebrate the fact that development is happening in Boston. Development should flow to any city that, like Boston, enjoys a deep concentration of important academic and medical institutions. Cambridge is currently enjoying a building boom that’s similar in scope to the one underway in Boston. The fact that city manager-led Cambridge has pulled off this feat without the services of Menino, or any mayor to speak of, shows the extent to which political leaders enjoy credit for economic forces largely beyond their control. Developers will rush to build in Boston, regardless of who the next mayor is. What matters is what cities do with the development business they attract. This is where Menino’s building legacy lies. Menino found a way to tie massive downtown construction projects to the brand of small-ball, neighborhood-level politics that enabled him to dominate Boston for 20 years. Instead of making downtown development a zero-sum game, he seeded the benefits of downtown construction throughout neighborhoods. Menino greatly expanded a system of linkage payments that Flynn instituted. The linkage payments funnel cash from downtown developments into neighborhood-improvement projects like affordable housing projects. Menino also ruled over an affordable housing quota system that requires private housing developers to construct a minimum number of affordable units in every project they build. The linkage payments and affordable housing quotas work toward the same ends — they socialize private development, and spread the benefits of construction through the city.